King & Maxwell TV Review - Are You Screening? TNT‘s latest crime drama, King & Maxwell, has a somewhat familiar feel to it, but surpasses many of the network’s less interesting, but popular efforts. In the end, it looks as though that might not be a good thing. Much like USA, it isn’t difficult to know that you’re watching something on TNT. Whether it’s The Closer, Leverage, Perception, or Falling Skies, the network has a certain feel to it. Of course, there are two camps to these shows, despite the similarity of style and substance, and the real question for any show is which side we’re leaning toward. One camp begins and ends with The Closer. It’s a show I didn’t watch beyond the first season, largely because it flew out over left field and beyond so fast that I couldn’t even comprehend the interest, much less actually manage any. Good or bad, a lot of people watched, and loved, the show so much that TNT invented a new use for the term “spin-off,” wherein what we mean is that we’ve got the exact same show, minus the main character. An interesting move, and one that won out, because if you’ve got a ready-made fan base, it isn’t that difficult to do well. On the other hand, you can’t really get a lot of new viewers, especially in this case, because Major Crimes is, for my money, the most unwatchable show on television. Also in this camp are things like Rizzoli & Isles (which was pretty decent for the first few episodes) and Dallas. It’s the camp that is the backbone of the network, delivering ratings, and making money. The other camp, often managing fair success, is made up of things like Leverage, Falling Skies, and Perception. Possibly Southland, depending on how you look at things, and one or two others. These are the shows that are a little “out there,” and, for one reason or another, don’t fit in well with the other camp, and are likely after more or less the same demographic. If you like Leverage, you’ll probably find Perception pretty interesting (and it’s a great show), but you probably don’t have a Rizzoli & Isles mug on your desk. King & Maxwell seems to be aiming at bridging the gap, and it’s hard to tell how that’s going to go over, or how long the effort will last. Jon Tenney (a TV veteran with too many credits to mention, and former member of the cast of both The Closer and Major Crimes) stars alongside Rebecca Romijn. The pair are ex-Secret Service agents who work as private investigators. The show kicks off with a rather corny chase, and opens out into something of a buddy cop movie turned into a series. The pilot is above-average in terms of managing the establishment of the characters, but doesn’t give us a great idea how individual episodes will play out. Here’s a show that I would love to see abandon the long arc almost entirely, and just give us interesting cases taken on with a unique approach. King and Maxwell obviously don’t work the direct route to any case, and it’s the effort at bringing in a wide mix of genres delivers the long-term hooks here. The question is, does the show have what it takes to capitalize? It’s a tough call. Despite the effort at something fresh, Tenney’s character might easily be found in a rundown office, drinking gin while a slow piano serves as the background to his voice-over ruminations about the fateful day some dame walked into his life, and that’s a good thing. Romijn’s Maxwell, by contrast, takes her kayak to work. What’s actually refreshing is seeing partners with differing points of view, who don’t have to devolve into The Odd Couple. The show is certainly fun, and gives you an entertaining ride, but it skirts the line of being too stuck in its TNT home, which doesn’t give the impression of being something that will work from either direction. If it’s too far afield from the network’s big players, will King & Maxwell get the audience, and/or will the show veer toward the mindlessly dramatic after a few episodes (ala Rizzoli & Isles) in order to fit in with the money camp? Like Rizzoli & Isles, King & Maxwell is based on a series of books, and that might be the ultimate tell here. I suspect that if we stay true to the spirit of those works, we’ll be merging in with Leverage and Perception, and the show could eventually shine. You want to hope for that, because the show is actually fun, and the stars have the right rapport on screen. Given that, even just in the pilot episode, the show seems to want to invest a decent amount of energy exploring its characters, there is reason to look toward the potential. If King & Maxwell can actually get there (I have a feeling that right about the eighth episode is going to let us know), it could break out into a show that manages to change the general view of TNT. 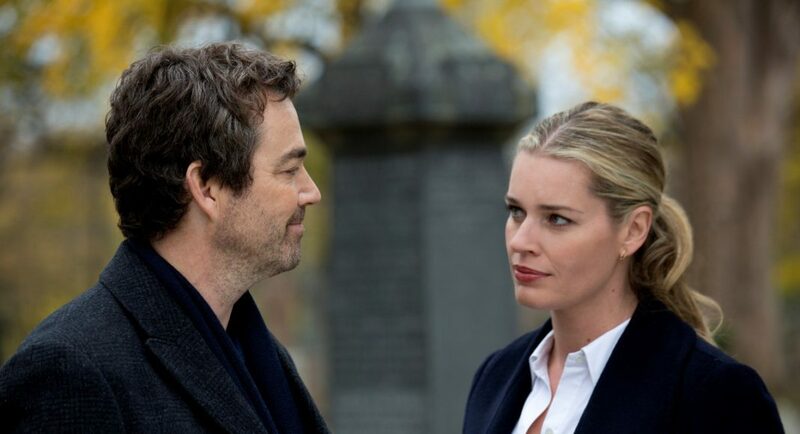 Jon Tenney (The Closer) and Rebecca Romijn (X-Men) are about to join TNT’s enormously popular stable of crime solvers when they headline the brand new scripted drama King & Maxwell. In the new series, they will play private investigators Sean King and Michelle Maxwell, characters originally seen in the bestselling series of books by author David Baldacci and developed for series by NCIS: Los Angeles creator Shane Brennan. King & Maxwell is set to premiere Monday, June 10, at 10 p.m. (ET/PT), immediately following the season premiere of TNT’s hit drama series Major Crimes. Sean King (Tenney) and Michelle Maxwell (Romijn) aren’t your typical private investigators. Both are former Secret Service agents, and their unique skills – not to mention their razor-sharp chemistry – give them a leg up on conventional law enforcement. Maxwell is a former elite athlete who uses her brains, beauty and Beltway connections to solve cases. King’s career in the Secret Service ended when the presidential candidate he was assigned to protect was assassinated, sending him on a downward spiral. Today, King has added a law degree to his arsenal of skills, allowing him to navigate the system in ways a typical private investigator never could. Along the way, King and Maxwell clash over everything, from her garbage-strewn car to his love of wine over beer. King & Maxwell also stars Michael O’Keefe (Michael Clayton) and Chris Butler (The Good Wife) as F.B.I. Special Agents Rigby and Carter, who clash with King and Maxwell over their less-than-legal methods. In addition, Ryan Hurst (Sons of Anarchy, TNT’s Wanted) stars as Edgar Roy.